Fresh Basil, garden tomatoes, sliced peppers in my stir fry, and the grill cranked all summer. Can you hardly wait? I can almost smell and taste them right now. Our North Carolina ice and snow-mageden is finally over and yesterday’s time outside felt wonderful. Nearly all of the NC gardeners have been throw for a loop with the low temps that consistently plagued our region, so I am way behind in all my gardening plans. Since I was focused on scraping my car each morning, gardening was not in my mind. I know, I know, there is no excuse. I am dreaming about my fresh Homemade Pico de Gallo with my homegrown basil and I can’t wait to use that same basil along with my peppers and tomatoes on this Grilled Veggie Pizza. Since we are attempting to eat with more whole foods and greens, which include lots of fresh salads and veggies. There are just so many delicious options for fresh garden growing. I am excited for grilling and if you have never tried a Grilled Pizza, this will revolutionize the way you think about family pizza night. You may never go back. Now unto this mouth watering Grilled Veggie Pizza. Summary: There’s just something delicious about grilled vegetables, but add them to a grilled pizza and you have pure happiness. Obviously, any veggies may be used or omitted. Make to your flavor preference. Preheat grill to HIGH heat. While grill preheats, heat 1 tbsp olive oil in sauté pan. Add chopped spinach and cover. Cook for 5 minutes. Add garlic and sauté for 1 minute. Remove pan from heat and cover. Combine zucchini squash, yellow squash, and peppers with 1 tbsp olive oil, black pepper and salt, tossing to coat and season with a dash of your preferred seasoning salt. Arrange vegetables on grill rack covered with heavy duty aluminum foil and coated with cooking spray. Grill 4 minutes, turning halfway through, or just until tender. Reduce grill to MEDIUM heat. Lightly brush each side of pizza crust with remaining 1 tsp olive oil. Grill 1 minute each side. 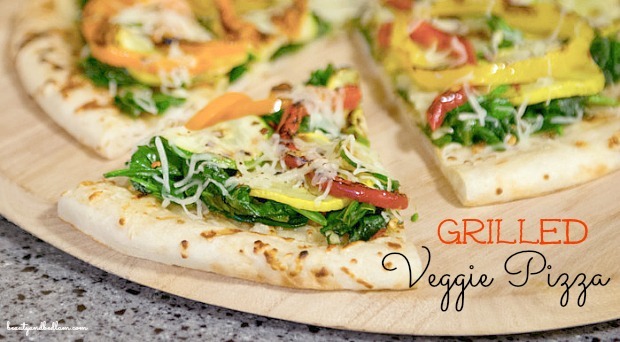 Layer sautéed spinach, grilled vegetables and tomato slices evenly over crust. Sprinkle with mozzarella. Grill 3 minutes or until cheese melts. Remove pizza from grill and sprinkle evenly with basil and crushed red peppers. Cut into 8 slices and serve. Mix & match your toppings to your taste and current garden harvest! Try it Caprese style with basil, tomato slices, fresh mozzarella, and balsamic vinaigrette drizzle on grilled crust. Or, skip the crust for a homegrown Caprese salad! So many delicious options! Enjoy!! There’s so much fun in growing your own produce and I’m excited to see your gardens this summer.